Earnings season is almost over. As of Monday morning, about 93% of the S&P 500’s combined market cap had reported their third quarter financial results, and on the whole, earnings for the index’s members rose 8.5% during the third quarter (or 7.9% ex-legal fees, which for some banks were quite large). But are we totally sure that this is how much companies actually earned during the quarter? Back in October, Matt Levine at Bloomberg View wrote a great column outlining the multitude of problems with Bank of America’s earnings report. As Levine wrote, the bank made, more or less, $US168 million in the quarter, though given the size of the $US186 billion bank it seems that, 1) it would be almost impossible to know this for sure and, 2) this amount really doesn’t matter to Bank of America. And if we go to what many would call the Bible of investing, Benjamin Graham’s “The Intelligent Investor,” we find that companies not exactly giving investors a 100% clear picture of what their earnings are is not a new trend. In “The Intelligent Investor,” Graham walks through Alcoa’s 1970 earnings statement. Alcoa, which is an aluminium giant and still a major economic bellwether, was an even bigger stalwart in the global economy 44 years ago. And so unlike Bank of America, which is in the business of playing with numbers, you’d imagine that an industrial company might have a more straightforward review of their financial results. 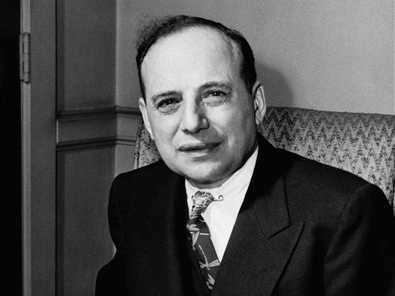 APBenjamin Graham was one of Warren Buffett’s mentor. For one, Alcoa presented four different earnings measures for 1970: primary earnings, net income (after special charges), fully diluted (before special charges), and fully diluted (after special charges). And after several pages of discussing Alcoa’s accounting treatment of special items and after-tax effects, the answer to the question, “What were the true earnings of Alcoa in 1970?” comes out to: we’re not sure. Graham also writes about Dow Chemical’s annual earnings report for 1969, in which the company included a $US0.21 charge that impacted the company’s growth comps — taking them to 4.5% year-over-year from 9% — and Graham writes that it seems “rather absurd” that this exact percentage would matter for an investor looking at the company’s future average profits or growth. 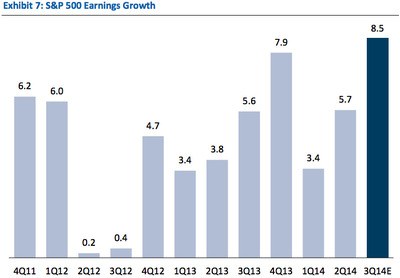 So then what to make of the S&P 500’s earnings growth this quarter, or any quarter? In a note to clients on Monday, RBC Capital Markets’ Jonathan Golub wrote that companies in the S&P 500 who reported earnings and sales that beat expectations saw their stocks rise 1.4% following the announcement, while those that missed saw shares tumble 3.1%. And so the risk-reward seems pretty clear: don’t miss on earnings. And while you could argue that a company’s earnings are what they are (and though this argument is often more forcefully made for sales, there are creative ways companies can roll forward and backwards revenue recognition, too), lots of people would argue that a company’s earnings are what they say, and add that these two statements are not the same thing. As Graham writes, “Corporate accounting is often tricky,” which seems a little like an understatement (though: see Levine again on the tension between whether or not things journalists and others say are complicated actually are). But as Graham concludes his chapter, “stock valuations are really dependable only in exceptional cases,” and earnings reports are part of this equation. Earlier this week, we highlighted commentary from Julian Emanuel at UBS, who expects the S&P 500 to rise to 2,225 by the end of next year, and as part of this thesis cited, among other things, 7% earnings growth. Now, of course if this is the earnings growth the market is expecting, and subsequently what companies deliver (whether as a result of looking to meet expectations or not), than investors can’t ignore the market’s realities: stocks will probably rise. And just last week, we highlighted academic research that highlighted the curious relationship between companies that beat on earnings reports and those that employ former stock analysts. At some point, you’ve just got to believe the magic.